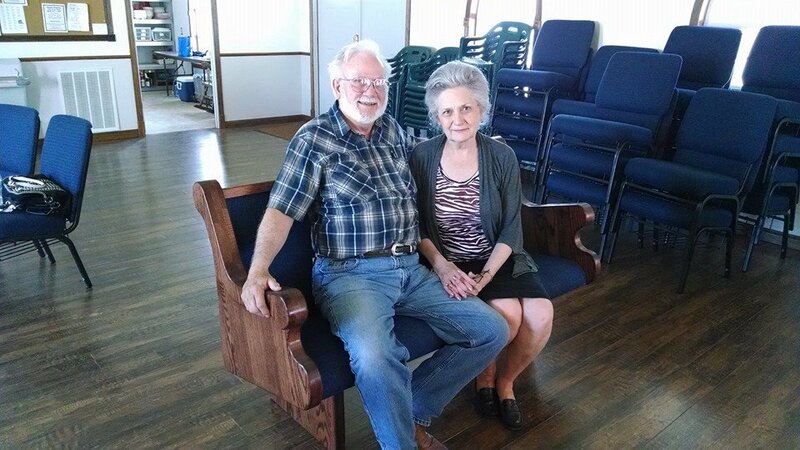 We made a recent trip to Wichita Falls, Texas to install some new church pews and met Arley and Nina Fancher while we were working. It is always a pleasure to get to know other Christians while we are on our travels installing new church pews. One of the best parts of the work we do is the communities we get to know and become a part of—in fact, we believe that every single one of our customers is part of the Born Again Pews family. We treat our customers with respect and dignity, just as Jesus asks us to. That means that along with ensuring our customers are happy with their new church furniture, we will do whatever it takes to keep our customers happy for a long time to come. One interesting thing you’ll notice about the church pews we installed in this Wichita Falls church is that they’re slightly angled. Why? Because that’s what works best for the space. The pulpit is at the center front of the sanctuary but the shape of the building makes it more logical to angle the church pews. Congregation members can be more comfortable without having to turn one way or the other to hear and see what is going on at the front of the church. It also means that there are more pews in the church than if they had been straight across in the angled space and more space for your members is always a good thing in our book. 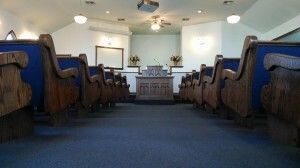 You’ll notice that the altar itself also has slightly angled walls behind it that and we made sure to mirror that angle with our church pews when we installed them. The replication of architectural elements like this in your church pews helps keep a cohesive look to your church. This church in Wichita Falls also chose a rich, dark brown stain for their solid wood church pews to match the other wood elements of their church you can see in the above photo at the altar. They also chose a deep blue fabric to match their dark blue carpets that pair nicely together, even though they’re not the exact same shade. It just goes to show you don’t need to match exactly to have a beautiful church. We would love to get to know your church like we got to know the church members in Wichita Falls and helped them renovate their church pews for comfort and looks. Call us today or get a free quote to find out just how affordable Born Again Pews’ church furniture really is.